This turn of evens has a highly detrimental effect on Israel’s strategic and military position. It also strengthens Iran’s supreme leader Ayatollah Ali Khamenei in his determination to turn the nuclear deal concluded in July into a tool for isolating the US politically, militarily and economically in the Middle East, rather than a milestone on the road to a breakthrough in ties with Iran, as the Obama administration had hoped. Our military sources find evidence that the Chinese forces are digging in for a prolonged stay in Syria. The carrier put into Tartus minus its aircraft contingent. 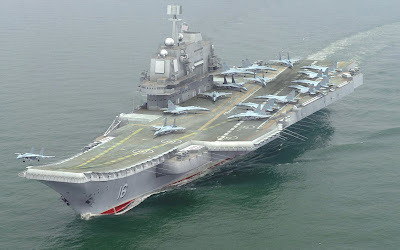 The warplanes and helicopters should be in place on its decks by mid-November – flying in directly from China via Iran or transported by giant Russian transports from China through Iranian and Iraqi airspace. The coordination cell – or war room – was presented as necessary to begin working with Iranian-backed Shiite militias fighting the Islamic State in both places. But more immediately, it is urgently needed to control the heavy traffic of Russian, Iranian and Chinese military flights transiting Iraqi air space. Our sources report that the Chinese will be sending out to Syria a squadron of J-15 Flying Shark fighters, some for takeoff positions on the carrier’s decks, the rest to be stationed at the Russian airbase near Latakia. The Chinese will also deploy Z-18F anti-submarine helicopters and Z-18J airborne early warning helicopters. In addition, Beijing will consign at least 1,000 marines to fight alongside their counterparts from Russia and Iran against terrorist groups, including ISIS.